Monitor and control temperature or process applications with precision using the CN142 Series controllers. 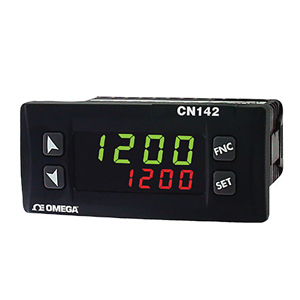 The CN142 Series provides dual LED displays for local indication of process value and setpoint value. Control methods include on/off, PID, auto-tune and manual-tune. Controller includes a 3 setpoint ramp/soak control feature, and also includes alarm, event and timer functions with optional RS485 communications. An optional software package CN-SW-HW-KIT includes cable and configuration module for quick configuration of units, as well as copying configuration parameters from one unit to another. The configuration module can also be purchased separately and with a built-in battery feature, configuration settings can be downloaded and copied to the module without power applied to controller. The module can then be plugged into a new unit without power applied and the configuration setting can be transferred for easy set-up for multiple units.